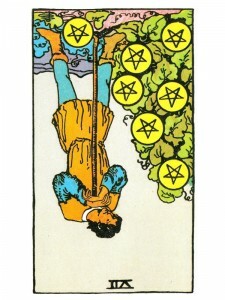 Seven of Pentacles (R) says you are experiencing dissatisfaction – the trapped feeling that comes from an unsatisfying lifestyle, job, relationship or commitment. Face and move through the self-doubts that raise your fear of failure and the apprehension that your work will all be for nothing. No matter what you do – there is a certain point that you have to wait for the results and allow the fruit to ripen in its own time. Calculate your odds, sow the seeds most likely to grow – let go of your expectations and cultivate patience. When you experience anxiety and depression related to your finances, do not allow these anxious thoughts to create depression. Learn from the lesson being presented and understand that when you are centered on feeling sorry for yourself – you are unable to carry on with your project and your own impatience can ruin everything. Make no rash decisions now – before you move ahead, always think carefully and ask yourself “Is this what I really want?” Maintain balance on all levels and take care that you do not hurt anyone during the transition. A lack of resources, perhaps in spite of good efforts. A poor harvest. The next phase may require a tightening of the belt, budgeting or rationing. Delay or blockage with new cycle. Immaturity in a physical/material matter. A lack of physical readiness for the next phase. A rift with nature – attempting too much control over…a natural disaster destroying mans prosperity. Theft, someone else harvesting your crops. What mistakes did you make in a similar situation and what can you do differently now? Nine of Cups and Wheel of Fortune in the spread: Your intuitive powers are acute now – you can make important decisions. In the first position: In your line, it has fallen to your generation to make something new of the seeds you were given. You may not even get to plant the same crop or use the same field. You must continue the old while initiating the new. In the second position: You may have miscalculated and do not have what you think you have or what you need, for the project at hand. There may be resources, but they are not yours. There could have even been theft here. You may have killed the golden goose. In the third position: Do not try to rely on any resources that are not yours. Curb your appetite. In the fourth position: Too much in this archetype can lead to avarice, gluttony and the like. Little appreciation for the next generation. You may lust after what belongs to others. In the fifth position: Perhaps you do not feel prepared for the next move. You may be eyeing resources that are not yours. In the sixth position: If silos are overflowing or if the harvest was unsuccessful, there are emotional ramifications. In the seventh position: Responsibility for material affairs can degenerate into fear of severe loss and at this level more than its ramifications to your personal safety and security, is the potential effect on many others. In the eighth position: The extreme that would be feared here most would be the loss due to bad investment. But the other extreme has its potential drawbacks – the harvest here might have been inordinately large, such as over-promotion above the level of compentency at this time. In the ninth position: Whether the harvest was in fact good or it failed, the sense here is not satisfaction. The reaction could be straight forward disappointment or it could be facetious celebration. In the tenth position: The fork presented within this next year will have drawbacks that you must seriously consider.